As we move into Phase Two, our first order of business will be to begin building our Prenatal Clinic and CHE office. This building will provide space for expectant mothers to gather. We’ll provide bi-weekly prenatal classes. At the same classes, women will receive their prenatal checkups. The Community Health Education (CHE) office will provide a space for our staff to prepare lessons and prepare for their visits into the local community to teach on community health topics and to visit mothers who have recently delivered their babies. 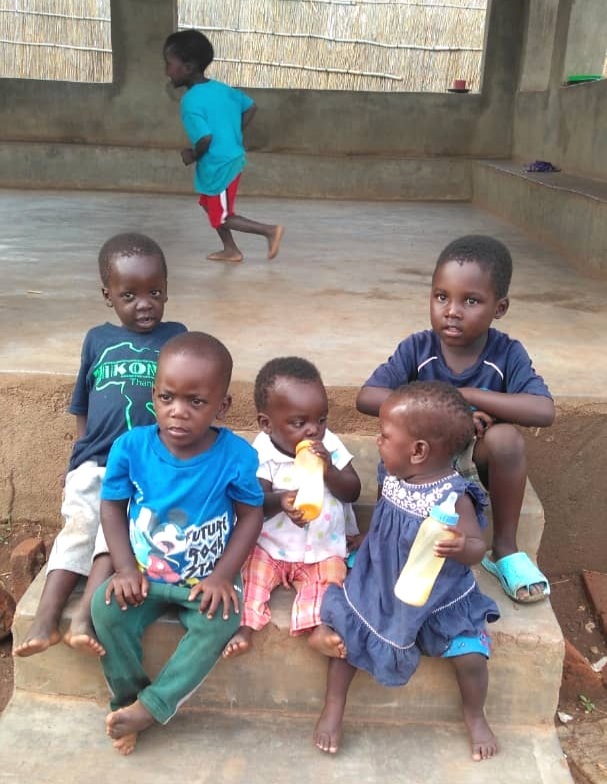 While I love having these precious little ones in our orphanage, my heart is broken that they have never had the opportunity to know their mothers. From the Left: Matthews’ mother was very young and carrying twins. Complications arose in childbirth and the attendants were unable to get help fast enough from one of the larger hospitals or to help the young mother. Matthew’ mom and twin died that day. Matthews was premature and spent the first two months of his life in a kangaroo pouch our caregiver mothers wore. L to R: Matthews, Jackson, Aida, Lizzy, Jachai. Jackson’s mother was giving birth at a government clinic, the closest one to our community where most of the women in our community give birth. This clinic is notorious for it’s poor treatment of women, often leaving them to deliver on their own, or sending them outside just as they are ready to deliver. We won’t talk much about them, but the attitudes and poor behavior of health care professionals that the women of our community have suffered under are appalling. For today, our story focuses on Jackson’s mother. She began having difficulties immediately after giving birth, the clinic called for an ambulance to come from our district hospital, but it took more than 4 hours for the ambulance to arrive. Doctors didn’t inform the family, but Jackson’s mother was already dead by the time the ambulance arrived. Aida, Lizzy and Jachai’s stories are similar. Too little care, not enough knowledge, complications without a resolution, distances that are too far to cover quickly in an emergency, poor attitudes and unprofessional behavior from healthcare providers, these are just some of the reasons we will be building Grace Community Health Center and opening our doors to care for expectant mothers. We’ll be providing a a place for training, for professional, courteous care and access to quick emergency services. We love our orphan babies, but honestly, an orphanage is NOT the best place for these precious little ones. They need to be raised in a family, surrounded by their mom, dad, siblings, grandparents and community. We are so excited to be done with Phase One! Please help us take the first steps of Phase Two today! Posted on December 13, 2018 by Karen Roller.